is a fulltime Blue Badge Tourist Guide who works in Birmingham and across the whole of the Heart of England region. He offers both guided coach and walking tours of the Second city. Roger's tours include much of its heritage since the Victorian era, including Bournville with Cadbury's, JRR Tolkien and the Jewellery Quarter. Also links to its musical heritage on a unique guided tour, talking about the many groups and artists who have originated from Birmingham. These include The Move, Black Sabbath, Moody Blues, Led Zeppelin and many more. It can be enhanced with tours of the nearby area including Coventry(Green Badge Tourist Guide), the Black Country, Stratford upon Avon, Royal Leamington Spa, Warwick and much more. 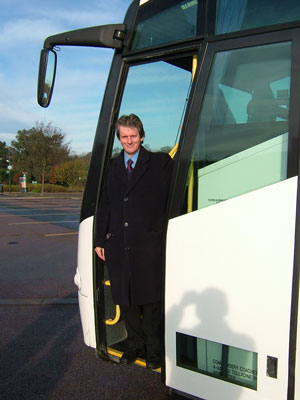 Roger also offers conference support with meet and greet plus airport and hotel transfers. He is a member of the Institute of Tourist guiding, Guild of Registered Tourist Guides, Heart of England Tourist Guide Association and the Coventry Guild of Tourist Guides. He was awarded the: 'Outstanding Contribution to Tourism' in the 2010 Heart of England Excellence in Tourism Awards, for his contribution to tourism in the Heart of England over many years of working in the industry and by the end of 2016, had conducted over 5,300 guided tours across the region.